It was not long into the new year before my 4-year-old started to ask how many sleeps to go before Christmas! Thankfully we have lots of spring birthdays and school holidays to help him break down the year into tangible chunks, but for most young children, grasping the concept of time is hard. One useful way to get over this, is to use seasons to explain how long things will take. I explained the life cycle of a deciduous tree in our garden. This took him up to winter. Also, we planted some sunflower seeds and talked about how tall they would have to grow before even the summer has ended. It turns out that he was just a bit sad about packing the Christmas decorations away, so for his benefit, we have made him an Easter tree. This will be our table centre piece during the school holidays, and he can load it with all manner of homemade decorations and chocolate eggs. “Everyone has to have a birthday before it’s Christmas again” reported my 7-year-old – a succinct explanation, and a fine example of me being shown up by a child. To make our Easter tree we used a bright blue pot with a saucer and we found a large twig that looked like a tree. We secured the twig in the base of the pot with gravel, leaving room for compost. Then,protecting the pot with newspaper, the twig was painted white. 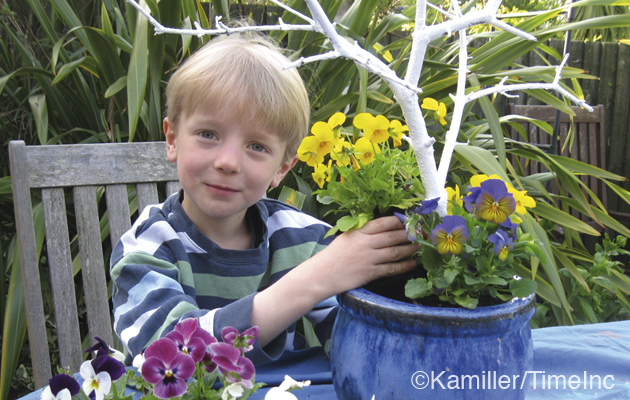 We chose yellow pansies to plant around the base of the twig, a nice contrast against the blue pot. We watered the plants first and teased out the roots to help them establish then filled in the gaps between the plants with compost.